Teachers: This material examines Newton’s Second Law of Motion in a way that will help you teach the law to your students. The photocopy-ready Student Activities pages will give students the opportunity to learn aspects of the Second Law in a way that they will find interesting and fun. Notes about each activity appear in the Notes to Teachers section. The activities can be tailored for the level of your students, and can be completed individually or in groups. In addition, students will create a logbook, called Newton’s Lawbook, in which they can take notes and track their findings from the scientific experiments offered in the Student Activities pages. In the presence of a net force, an object experiences an acceleration. Newton’s Second Law of Motion introduces one of the most important fundamental concepts in science: mass. Sir Isaac Newton used the word “mass” as a synonym for “quantity of matter.” Today, we more precisely define mass as a “measure of the inertia of a body.” The more mass an object has the more difficult it is to change its state of motion, whether it is at rest or moving in a straight line at a constant speed. Think of it this way: An elephant has more inertia than a mouse. It is much harder to push an elephant across a floor than it is a mouse, and much harder to stop the elephant once it is moving. Therefore, by definition, an elephant has more mass than a mouse. Newton’s Second Law takes up where the First Law ends. The First Law describes inertia: A body will not change its existing state of motion without a net force acting on that body. In other words, without an outside force a body will remain still if still, or, if moving, keep moving in the same direction at a constant speed. But what happens when a net force interacts with inertia? The Second Law tells us that a net force will change the velocity of an object by changing either its speed or its direction. Such a change in velocity is called an acceleration. So, we can say that a net force gives rise to acceleration. The Second Law goes on to mathematically define the exact relationship between net force and acceleration: The acceleration of an object is directly proportional to the net force acting on it and is inversely proportional to its mass. Also, the direction of the acceleration is in the direction of the net force acting on the object. More simply, and as Newton put it: F=ma, where “F” (force) and “a” (acceleration) are both vector quantities, and “m” is the object’s mass. Note that the “F” in this equation is the net force, that is, the sum of all the forces acting on the object. In SI units (metric system), mass is measured in kilograms, acceleration is in meters per second per second, and the unit of force is the newton (N). One newton is the force required to impart an acceleration of 1 m/sec2 to a mass of 1 kg (1N = 1 kg m/sec2). By the way, the newton unit of measurement was named in honor of Sir Isaac himself. 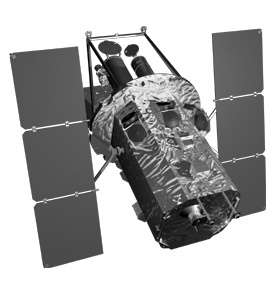 Swift is a space-based multiwavelength observatory dedicated to the study of gamma-ray bursts. Its purpose is to determine the origin and nature of these powerful cosmic explosions; determine how the blastwaves from the bursts evolve and interact with their surroundings; and determine if these bursts can be used as effective probes of the early Universe. Scheduled for launch in Fall 2003, Swift is a collaboration between the United States, the United Kingdom, and Italy. Swift has a mass of about 1,400 kilograms, which is about the same mass as 30 ten-year-olds in a bag! In order to get the Swift satellite into orbit, it will be launched from a Boeing Delta rocket with a mass of about 231,800 kg. With Swift inside the rocket, the combined mass of the two will be 233,300 kg! The Earth’s gravity pulls the rocket (with Swift inside) down with a force of about 2,285,000 newtons. But the rocket’s boosters can exert an upward force of about 2,722,000 newtons. This means that the upward force is stronger than the downward force by about 437,000 newtons. As the rocket lifts off, it will have a net upward force of 437,000 newtons exerted on it. With a total mass of 233,300 kg, the rocket will accelerate upward at a rate of 1.8 meters per second per second (acceleration = force / mass). In other words, for every second of travel time the rocket will increase its velocity by almost 2 meters per second. As Newton’s Second Law explains it: In the presence of a net force, an object experiences an acceleration (F=ma). Teachers: Use the following demonstrations to introduce Newton’s Second Law to your class. Place an empty cardboard box and two or three bricks or heavy books on a table (or the floor). Push the empty box across the table. Note how much force was required to perform the task. Now put one of the bricks or books in the box. Again, push it across the table. Was more, less, or the same amount of force required to accomplish the task? Add another brick or book to the box and push it across the table again. Was more, less, or the same amount of force required this time to accomplish the task? Explain the experiment using the proper physics vocabulary of force, mass, acceleration, velocity, distance, time, etc. Whirl a yo-yo at the end of its string in a vertical path. Ask the students if the yo-yo is changing directions. Be prepared to explain that even though it is traveling in a continuous circle it is indeed changing directions. Only motion in a straight line is motion that is not changing its direction. Movement in a circle is actually a continuous changing of directions. Therefore, it must be undergoing an acceleration.Ask what force is acting on the yo-yo to change its direction. 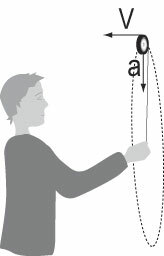 In an open discussion, explain to students that it is the force of your hand pulling on the string which changes the yo-yo’s direction. Explain that the yo-yo is undergoing two motions at once: It is going up and down as well as left to right. Discuss other examples of objects which undergo two motions at once. Examples may include an airplane lifting off from the runway, a skier going down a hill, or a baseball hit by a batter. To undergo two motions at once requires the existence of more than one force – one force may get the object moving while the other changes its direction. For example, the bat may provide the force to move the ball forward and up into the air, but it is gravity providing the force which causes it to arc toward the ground again. You can demonstrate this by throwing or kicking a ball. Students: These activities will help you learn all about Newton’s Second Law of Motion. Use the notebook, which you have designated as your Newton’s Lawbook, to take notes, track your progress, and evaluate findings from the experiments you will conduct. Start by writing down Newton’s Second Law of Motion. In this experiment you will examine Newton’s Second Law of Motion by investigating the relationships between force, mass, and acceleration. 1. Determine the mass of each ball bearing and marble. Record the masses in the Table below. of 5 to 10 degrees. 3.Starting from the top of the ramp, put marks along the track at 30 and 60 centimeters. tracks are joined. Put a book at the end of the last track. 5. Put one of the ball bearings at the bottom of the inclined track, where it becomes level. 2. Before you release the marble, predict what will happen when the marble hits the ball bearing. notes in your Newton’s Lawbook. and calculations in the Table below. strikes the other ball bearing? Write your predictions and results in your Newton’s Lawbook. your results in the Table below. bearing. Enter your data and results in the Table below. 4. Now calculate the results for the target ball in the Table below. Now let’s put it all together. Look at the force applied by the rolling ball (Fi = miai) and the acceleration of the target ball (at = Fi/mt). Note that “i” represents impact, and “t” equals target. Write your answers to the following questions in your Newton’s Lawbook. balls increased (due to the larger masses)? 2. Using mathematical language, explain the relationship between force and acceleration. As you know, when you throw a ball it inevitably falls back to the ground. Newton’s First Law of Motion tells us the ball would travel in a straight line forever unless a force acts on the ball. So a force must be acting on the ball. But what force? The answer, of course, is gravity. The pull of gravity between the Earth and the ball causes the ball to drop. All pulls or pushes are called forces. 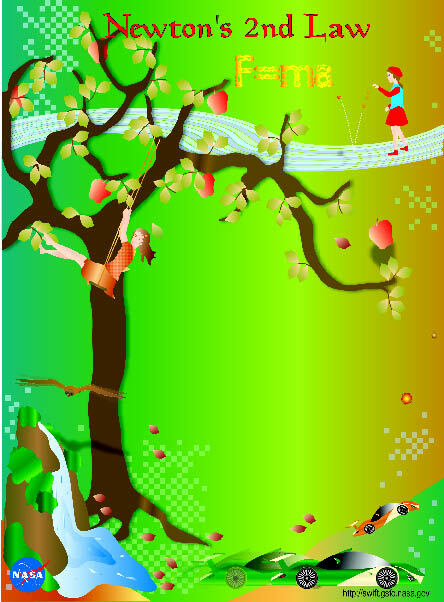 The pull (force) of gravity causes rising objects to decelerate (a negative acceleration); the pull of gravity causes falling objects to accelerate. Whether you throw a ball, hit one with a bat, or launch one from a cannon, the ball follows a curved path called a trajectory. The shape of the path is a parabola. All tossed balls, regardless of their initial speed or the height at which they were released, follow a parabolic trajectory. In this experiment you will investigate some of the properties of this motion. You will investigate what factors affect the shape of the trajectory, how they affect it, and why they affect it in that way. 12” x 12” piece of posterboard or cardboard. Using a protractor, start at a given point and make lines with a black marker at angles of 0, 15, 30, 45, 60, 75, and 90 degrees. Tape or glue of some sort of handle to the back of the board to make it easy to hold in a vertical position. which to fire the gun for each trial, i.e., from the top of a chair or table top. times for each angle to average the results, and use four or five different angles. prepared to discuss any uncertainties you came across in the experiment. terms of forces, masses, and accelerations. To calculate the acceleration of the ball at the time of impact, subtract the ball’s initial speed (which is zero) from its final speed and divide by the time it took to hit the target. In this exercise acceleration is independent of mass, but it does depend on diameter (since the balls are rolling, not sliding or free-falling) so choose the balls to be as close to the same size as possible, and don’t use any hollow balls. The acceleration for the balls of different masses should then be the same. Students will find that the balls with a larger mass will cause the target ball to travel the 100 cm distance in less time. Point out that although the mass of the impactor ball changes, the mass of the target ball remains constant. force varied depending on the mass of the impact ball. of the impact ball.The impact balls all had (about) the same acceleration, but different masses. other words, if the mass is constant, the force and acceleration are directly proportional. To begin this lab, perform the following demonstration: Fire the gun horizontally and note where the dart lands. Ask your students to think about what happens when the dart is fired horizontally. Once the dart first leaves the gun, it will continue to travel horizontally at its initial speed, since no force is being applied in the horizontal direction. We know this from Newton’s First Law of Motion. However, once the dart is shot from the gun, the force of gravity acts on the dart, pulling it directly downward toward the ground (perpendicular to the motion of the horizontally-fired dart). Newton’s Second Law tells us that this force will introduce an acceleration to the dart in the downward direction. Ask students what could be done to make the dart travel farther. If the students suggest tilting the gun up, try it. If not, tilt it up at about 20 degrees and shoot the dart again. Ask students what they notice about where the dart lands. From this, lead them into the investigation of what angle they need to shoot the dart in order to make it travel the farthest distance. What factors determine how far a projectile will travel in the horizontal direction? The distance is determined by the initial speed of the projectile, the mass of the projectile, the amount of friction (including air resistance) the projectile encounters, the height from which the object is projected, and the angle at which it is projected. In the experiment done here, several of these factors are made virtually constant: the initial speed of the dart as it leaves the gun; the dart’s mass; the air friction (assuming the experiment is not done outside on a windy day); and the height at which the dart was shot. As a result, we can investigate the relationship between the distance traveled and the angle of initial velocity. We will, for now, ignore air friction and think only about the initial velocity of the dart and the acceleration due to gravitational force. Students will figure out that firing the dart at a slight upward angle will cause it to travel a greater horizontal distance. However, horizontal speed is lost and the distance traveled is shortened when the firing angle becomes too steep. At a large launch angle, most of the force exerted on the dart moves it upward, rather than forward. What angle will achieve the maximum horizontal distance? In the real world, the actual angle will vary from experiment to experiment because of differing air resistance effects. However, the results should cluster around the theoretical expectation, 45 degrees. slows down the dart. Eventually, all of the dart’s forward motion is lost and it falls straight down. the air by increasing the height of the firing position. given angle. Use gum, wax, or tape to stick a dime or penny to the suction tip of the dart.